The theremin AV controller enables me to scrub audio and video samples live, using the pitch and volume aerials of the theremin. I created this simple but highly unusual controller using Max/MSP + Jitter. I perform with vocalist Jenny Angliss (and sometimes with guitarists Mike Blow and Ben Kypreos too), under the band name Spacedog. 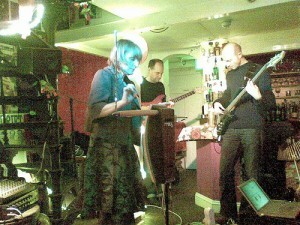 If you’ve been to a recent Spacedog gig, you’ve probably seen the theremin controller in action. Here’s a video of me using the device in a rehearsal. As you can see, I’m controlling the speed of audio and video clips with the pitch antenna. I can also control volume of the samples using the volume antenna. The music in the video is Willow’s Song (Paul Giovanni), as featured in the British classic horror film The Wicker Man (1973). Here, it’s being mixed with a sample from Hammer classic The Devil Rides Out (1968), plus a 1950s parakeet training record. I’m controlling the hypnotic voice of actor Charles Gray. Jenny is on vocals and Ben on guitar. Mike, in the green teeshirt, is cueing up the various samples I’ve prepared, as the song progresses. Apologies for the lame sound of the ‘straight’ theremin this video – you’re hearing the sound through the desk. We were monitoring live and the gallery was so reverberant, we had to ditch every hint of vibrato to avoid complete chaos. This version of the Willow’s Song was first performed at Atters’ Other World, the Brighton Festival Fringe, June 2008, then our sell-out show at the Sanctuary. Here, you’re watching an excerpt from a live playthough of our set in the Blank Gallery, Brighton. Lighting conditions in the gallery prevented us from filming the projected video live, so keen-eyed observers might notice that we’ve added that after filming.